The Buchholz relay is a gas operated relay used for the protection of oil immersed transformers against all the types of internals faults. It is named after its inventor, Buchholz. The slow developing faults called incipient faults in the transformer tank below oil level operate Buchholz relay which gives an alarm. If the faults are severe it disconnects the transformer from the supply. It uses the principle that due to the faults, oil in the tank decomposes, generating the gases. The 70% component of such gases is hydrogen which is light and hence rises upwards towards conservator through the pipe. 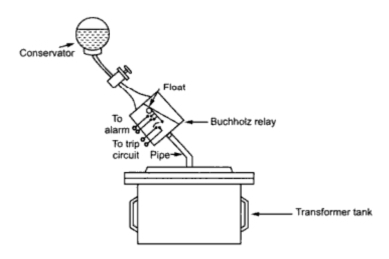 Buchholz relay is connected in the pipe, as shown in the Fig. 1. Due to the gas collected in the upper portion of the Buchholz relay, the relay operates and gives an alarm. The construction feature of Buchholz relay is shown in the Fig. 2. Under normal conditions, the Buchholz relay is full of oil. It consists of a cast housing containing a hinged hollow float. 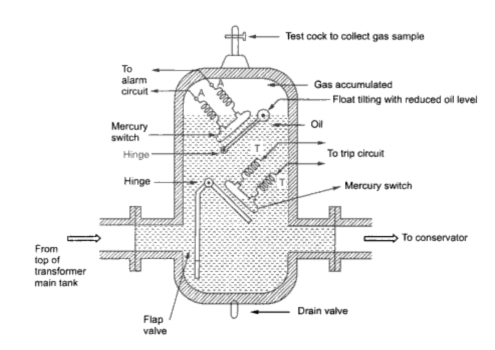 A mercury switch is attached to a float. The float being rotated in the upper part of the housing. Another hinged flap valve is located in the lower part which is directly in the path of the oil between tank and the conservator. Another mercury switch is attached to a flap valve. The float closes the alarm circuit while the lower flap valve closes the trip circuit in case of internal faults. There are many types of internal faults such as insulation fault, core heating, bad switch contacts, faulty joints etc. which can occur. When the fault occurs the decomposition of oil in the main tank starts due to which the gases are generated. As mentioned earlier, major component of such gases is hydrogen. The hydrogen tries to rise up towards conservator but in its path it gets accumulated in the upper part of the Buchholz relay. Through passage of the gas is prevented by the flap valve. When gas gets accumulated in the upper part of housing. The oil level inside the housing falls. Due to which the hollow float tills and close the contacts of the mercury switch attached to it. This completes the alarm circuit to sound an alarm. Due to this operator knows that there is some incipient fault in the transformer. The transformer is disconnected and the gas sample is tested. The testing results give the indication, what type of fault is started developing in the transformer. Hence transformer can be disconnected before grows into a serious one. The alarm circuit does not immediately disconnects the transformer but gives only indication to the operator. This is because some times bubbles in the oil circulating system may operate the alarm circuit through actually there is no fault. However if a serious fault such as internal short circuit between phases, earth fault inside the tank etc. occurs then the considerable amount of gas gets generated. Thus due to fast reduce level of oil, The pressure in the tank increases. Due to this the oil rushes towards the conservator. While doing so it passes through the relay where flap valve is present. The flap valve gets deflected due to the rushing oil. Due to this the mercury switch contacts get closed. This energizes the trip circuit which opens the circuit breaker. Thus transformer is totally disconnected from the supply. The connecting pipe between the tank and the conservator should be as straight as possible and should slope upwards conservator at a small angle from the horizontal. This angle should be between 10 to . For the economic considerations, Buchholz relays are not provided for the transformer having rating below 500 KVA. 1. Normally a protective relay does not indicate the appearance of the fault. It operates when fault occurs. But Buchholz relay gives an indication of the fault at very early stage, by anticipating the fault and operating the alarm circuit. Thus the transformer can be taken out of service before any type of serious damage occurs. 2. It is the simplest protection in case of transformers. 1. Can be used only for oil immersed transformers having conservator tanks. 2. Only faults below oil level are detected. 3. Setting of the mercury switches can not be kept too sensitive otherwise the relay can operate due to bubbles, vibration, earthquakes mechanical shocks etc. 4. The relay is slow to operate having minimum operating time of 0.1 seconds and average time of 0.2 seconds.